If you are a Marin County resident interested in receiving gynecological and obstetrical care from our doctors, please contact our office to set up an appointment. Head east on Willow Rd toward Point Reyes Petaluma Rd. Turn left onto Point Reyes Petaluma Rd. Turn right onto Nicasio Rd. Slight left onto Lucas Valley Rd. Turn right to merge onto US-101S toward San Francisco/Eureka. Slight left on Lombard St. Turn right onto Webster St.
Destination will be on the left. 2100 Webster Street, Suite 319. San Francisco, CA 94115-2377. PGOMG has catered to residents of the San Francisco Bay Area and Marin County since 1985. Our practice’s care providers and staff are from a diverse mix of backgrounds and medical experiences. All of our physicians are board certified by the American Board of Obstetrics and Gynecology. 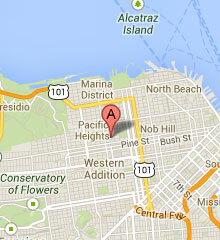 We are one of the largest, most experienced private practices in the San Francisco Bay and Marin County area. Pacific Gynecology and Obstetrics Medical Group is currently composed of 7 physicians with a common interest in assuming a leading role in our medical community, which includes Marin County. Our physicians and care providers are trained at some of the country’s top universities and medical schools, including Stanford, UCLA, Berkeley and Johns Hopkins. At PGOMG, our care and treatment options range beyond routine annual exams. Our gynecological care appointments also provide birth control information, menopause management, address incontinence and bladder concerns, STD screening and much more. At PGOMG we specialize in obstetrics, and offer the following services: preconception counseling, high risk OB management, in-office ultra sound, and pregnancy options. For the full list of obstetrical services, please click here. To see a comprehensive list of the services we provide please visit our care page. To read testimonials and see ratings from our patients including those from Palo Alto, please visit our read our reviews page.